My Modest Contribution to "Israel Apartheid Week 2013"
I wanted to make a contribution to "Israel Apartheid Week," be it ever so modest. So here it is, maybe a week or so late but all done in the best of faith. 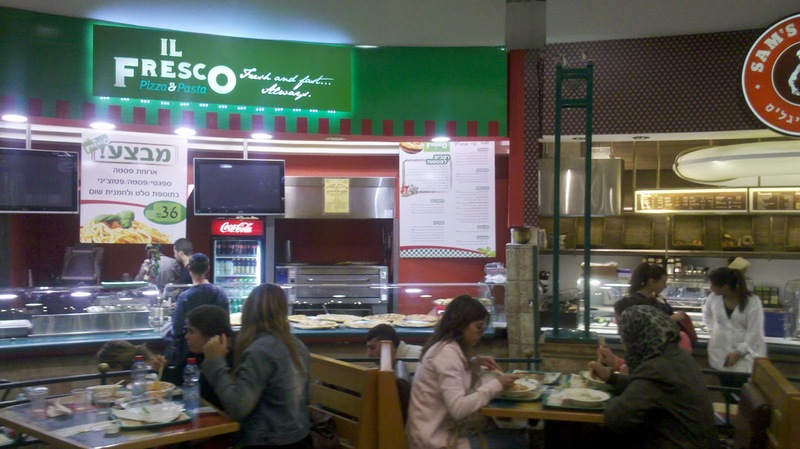 We see below a photo taken at the main Jerusalem shopping mall --called Manahat or Malha--- in the food court. An Arab Muslim woman wearing a gray, black-spotted headscarf, and two daughters are enjoying what seems to be an Italian style meal under conditions of excruciating apartheid. Note the sign in Hebrew מבצע under the sign in Italian Il Fresco. The Arab woman is sitting on the right side of the photo closer to the sign of Sam's Bagels. If you enlarge the photo by clicking on it, you can see a small yellow sign on the Il Fresco stand which is a certificate from the Jerusalem rabbinate attesting that the establishment is approved to dispense kosher dairy dishes. The photo was taken on March 11, 2013. Should we perhaps see this scene as an underhanded Israeli Zionist plot to undermine the credibility of "Israel Apartheid Week" which has been endorsed by sundry political frauds, no doubt Archbishop Tutu is one of them, by hordes of looney professors and by hosts of enraged fanatics in Europe, America and elsewhere? How dare they allow Arabs to enjoy meals in the shopping malls of Jerusalem with the sole intent of discrediting the feverish endeavors of BDS!! Earlier treatments of "apartheid" in Israel on this blog are here & here & here & here. Professor Shmuel Trigano analyzes the constitution drawn up by the Palestinian Authority for the proposed "State of Palestine". Trigano finds this constitution to be an apartheid document: here.